Cook without fire. That’s the simple premise of a new heating system from Korea. 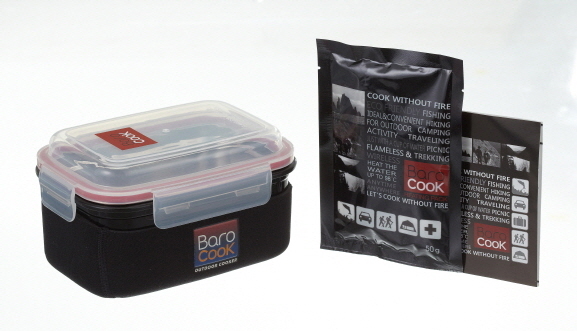 The Baro Cook system heats food using small packets that resemble tea bags and get hot when combined with water. The kit comes with vessels that nest into one another. You place a heating packet (which cost $1 – $3 each, depending on size) into the bottom container and pour in a little water. The water will start to boil within a minute. We saw this demonstrated several times last week at a trade show. It was amazing how the water reacted to the packets, going from cold H20 to a bubbling, steamy mixture in a minute.